After coaching volleyball at Cedar Falls High School for 14 years, head coach Matt Flaherty decided to resign. “I’m going to miss having him as a coach the next two years. He made it very fun to play,” sophomore Emma Gerdes said. The past couple of years Flaherty has considered resigning but just felt like this year was his time to step down and let someone else take over. There was not a specific time that Flaherty knew he was going to be done coaching, but there was a time when he thought that he could be done. The moment that really made him think that he could be done with coaching the varsity team was after they won the MVC tournament. After playing for coach Flaherty for two years, junior Brittni Wright will be spending her third and final year playing volleyball at Cedar Falls for a different coach. “I’ll miss his enthusiasm for the game and his love for all of us. He worked with a lot of girls throughout his career, and it was obvious that he genuinely cared about us all. 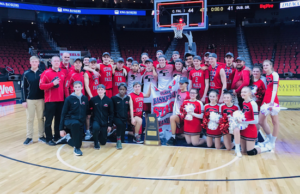 We ended on a great note being the first team to win the MVC tournament title, and I’m excited to see what’s in store for next season,” Wright said. Flaherty is still staying involved in coaching and volleyball by helping out with a newly formed Cedar Falls club volleyball program. This program was started by Adam Timmins, Flaherty’s former assistant coach, Flaherty himself and a few other people. “It’s a little more relaxing, and I still get to be involved in coaching,” Flaherty said. There have not been any decisions made on who will be the head coach for next season yet.